· On June 14, 1777, the Second Continental Congress proposed and passed the Flag Act of 1777. This resolution was designed to facilitate the creation of an official flag for a nation that was aiming to earn its independence from Great Britain. The flag was to have thirteen stripes, alternating red and white, with thirteen white stars on a blue field. The thirteen stars signified the original members of the Union. · The American flag remained unchanged until 1795, when the stripes and stars were increased to 15 for the addition of Kentucky and Vermont to the Union. · After seeing the new 15-star and striped flag flying over Fort McHenry during the War of 1812, Francis Scott Key was inspired to write the poem that would eventually become the nation’s national anthem. · A sea captain from Massachusetts named William Driver named a large, 10-foot-by-17-foot flag “Old Glory” after it survived multiple defacing attempts during the American Civil War. Driver’s nickname of the flag inspired the name to be used for all American flags. 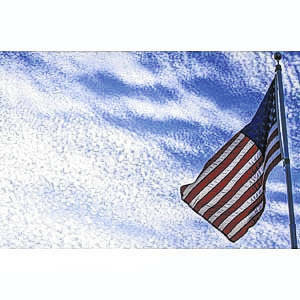 · Although Flag Day was established as a formal national holiday in 1949, it was not made a federal holiday. Flag Day is only an official holiday in the state of Pennsylvania. This may be fitting because legend holds that Betsy Ross sewed the first flag in Pennsylvania. · Today’s flag features the original 13 alternating white and red stripes (in 1818, another design went into effect, permanently setting the number of stripes at 13 in honor of the original colonies) and 50 stars to represent the states of the Union. The colors of the flag signify as follows: red for hardiness and valor, white for purity and innocence, and blue for vigilance, perseverance and justice. The Color Association of the United States creates the palette of colors used for both private and public institutions and the U.S. Army. Mass-market flag manufacturers tend to use Pantone Matching Shade of Dark Red (193 C) and Navy Blue (281 C). The American Flag has been a fixture of the United States for centuries and continues to serve as a symbol of pride, valor and history.